Back to the NPC index. 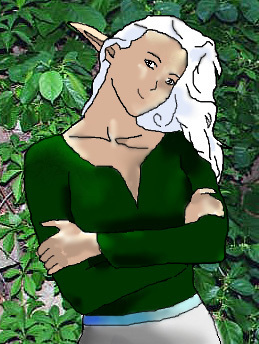 Hair/Eyes: Like most of the Syl, Elainas has white hair and green eyes. Elainas has risen to her position because of her natural talent at mediating conflicts, keeping a cool head, and seeming impartiality - at first glance. Over time, some have begun to suspect ulterior motives of her own in her actions, but have been unable to verify this. Being a representative of the Syl is a lonely life. Except for the occasional return to her homeland every decade or so, Elainas has had no time for her family or to start one of her own. This is important to a slowly shrinking culture like the Syl, and she has buried any personal pain by devoting herself to obeying the will of the Council of Elders. *Unless alone among friends or family, will always speak in cool, calm tones - despite the current mood or situation. *Elainas is desperately in need of a friend - or at least someone to talk to. Alas, she moves about so much that any friend she might make in the outside world she may never see again, so she walls herself up. *Her power stems from her title and the mystique of her Syl heritage. In any situation outside of the court or where people are either neutral or against elves, she's not very effective. Growing up, Elainas always wanted to see the world. She got her chance when the Council of Elders recognized the need for allies in the outside world to help them survive encroachments on their territories. After years of training, she finally became one of the first Syl ambassadors to the outside world since the Rending. Establishing contacts with the rest of Narada started out touch - and - go, (it still is, in many places) but among the other ambassadors, Elainas soared. Her work has raised many countries' opinions of the Syl over the decades, even if those countries did not decide to actually sign a treaty yet. All her successes aside, a life of travel and adventure is beginning to take it's toll. Elainas wants to settle down, but she swore to obey the Council on all matters and they consider her too valuable to the Syl to let her retire now. To date, she has kept any annoyance at the Council's wishes to her self, and remains their dutiful servant. This character is ©2000 by Spiffy.